might be associated with Craig Cole. That address is 1730 Labounty Rd. 1730 Labounty Rd. 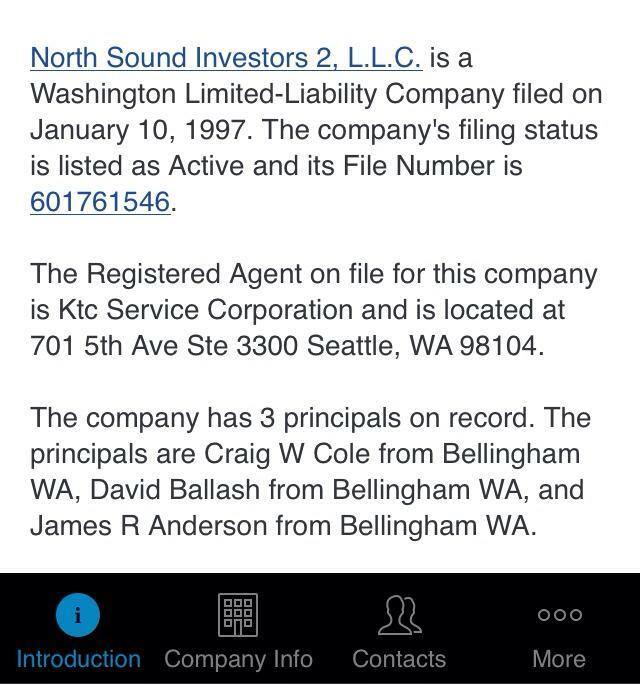 is the listed address for North Sound Investments 2 L.LC. North Sound Investments 2 L.L.C. has three Principals, one of whom is SSA Marine’s paid consultant/spokesperson for GPT, Craig Cole. 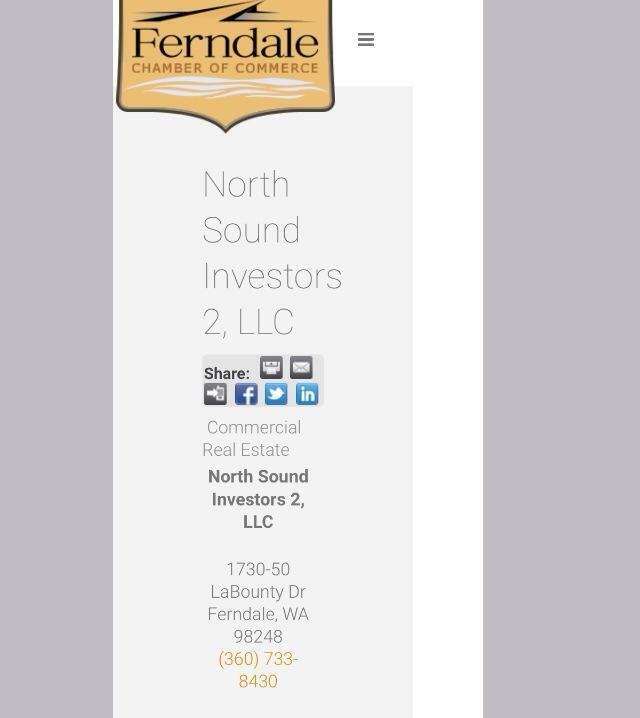 The Ferndale Chamber of Commerce lists North Sound Investments 2 L.L.C. as a member, and the phone number listed for the company is 360-733-8430. 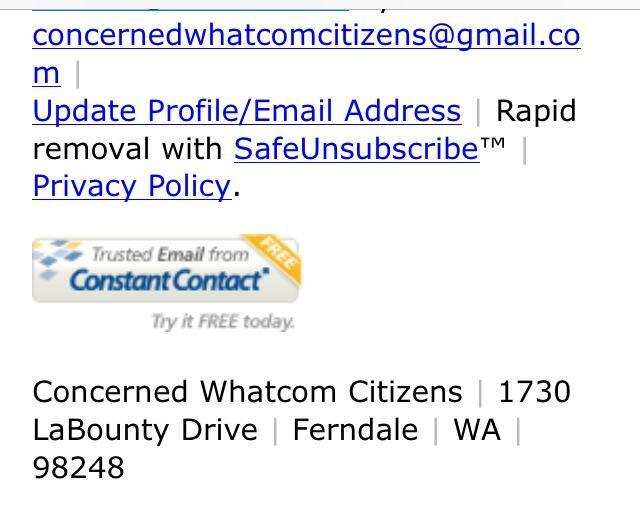 I did a search on the number 360-733-8430 and one of the search results that came up was the NWCitizen article containing the February 5, 2014 letter Craig Cole sent to Whatcom Watch threatening a libel lawsuit, claiming he was libeled in my article, “What Would Corporations Do? Native American Rights and the Gateway Pacific Terminal,” in which his name was never mentioned (in the screenshot photo I only showed the beginning of that 8-page letter). 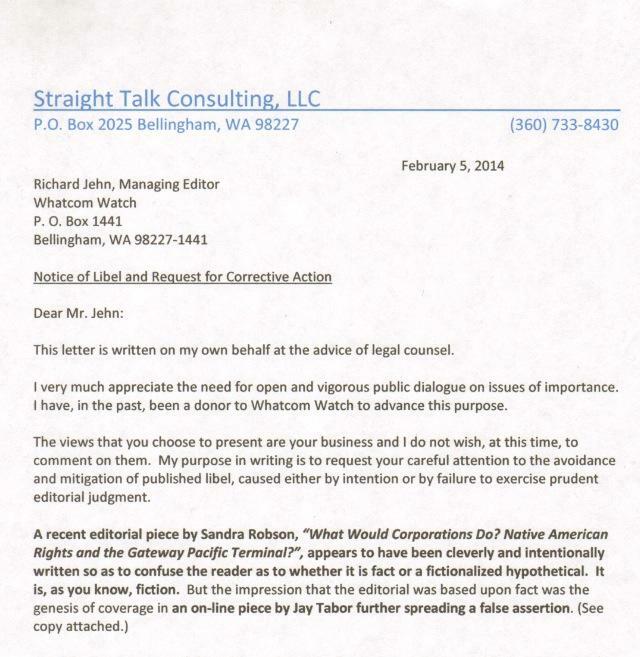 Right at the top of that letter, under Craig Cole’s consulting company name, “Straight Talk Consulting,” was the phone number 360-733-8430. Unbelievable how things can connect, right? So, the propaganda piece attacking RE Sources, alleging their group submitted the proposed Charter amendments to the County Council at the last council meeting, not only was sent by Gateway Pacific Terminal, but the address listed on the negative advertising piece appears to lead directly back to SSA Marine’s paid GPT consultant/spokesman, Craig Cole. SSA Marine/GPT is trying to manipulate the public with its alarmist, negative ad piece and SSA Marine/GPT is trying to manipulate our County Council elections. Throughout the Charter Review Commission process, many citizens felt they have not been listened to by the conservative Charter commissioners. So, citizens decided to propose 4 Charter amendments to the County Council for consideration, as is their right as citizens to do, and coal terminal proponents want to take that right from us. We need to all show up for the Tuesday, July 7 County Council meeting to protect our voting rights and our future. If you can’t attend, you can send the County Council an email voicing your support for the four amendments proposed to the council at the last council meeting, such as the 5 Fair and Equal Districts amendment. This entry was posted in Commentary, Facebook Post, Information and tagged Craig Cole, Gateway Pacific Terminal, GPT, Pacific International Terminal, SSA Marine, Straight Talk Consulting, Whatcom County, Whatcom County Charter Review Commission, Whatcom County Council. Bookmark the permalink.